by J. Richard Bowen, M.D., Anastacio Kotzias-Neto, M.D. 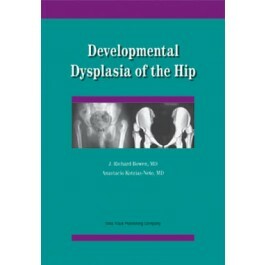 Written for physicians who treat children with developmental dysplasia of the hip (DDH). Non-operative, operative, and reconstructive treatments options are detailed. Variations in treatment methods are presented, in detail, comparing the outcomes. Included are the following: etiology, natural history, early diagnosis and non-operative treatment methods. Greater trochanteric arrest, Distal and lateral transfer of the greater trochanter, Lateral advancement of the greater trochanter, Double intertrochanteric osteotomies, shelf osteotomy, Chiari osteotomy, Kawamura osteotomy, Arthroscopy of the hip, Pelvic support osteotomy and limb lengthening, total hip arthroplasty, and hip fusion. 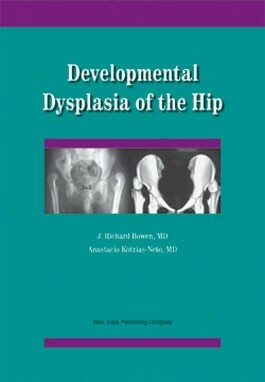 This text covers many concepts of developmental dysplasia of the hip, which include a brief history of some important articles, normal and dysplastic hip development, screening and diagnosis, and treatment with the outcomes and complications. J. Richard Bowen was reared in Whiteville, NC and earned a degree in chemistry from the University of North Carolina. He received a doctorate in medicine from the University of South Carolina in Charleston and performed residencies in general surgery with Dr. Curtis Artz, in orthopaedics with Dr. Crawford Campbell, and in pediatric orthopaedics with Dr. G. Dean MacEwen. He served in the U.S. Army for two years and then became a member of the faculty at the Alfred I. duPont Institute in Wilmington, DE. From 1987 until 2004, he was Chairman of the Department of Orthopaedics and currently is the Nemours Professor of Orthopaedic Education and Research. Anastacio Kotzias-Neto was reared in Florianopolis, Brazil and earned a degree in medicine from the Federal University of Santa Catarina, Brazil. He received a Masters degree and a Doctorate in Orthopaedics from the Sao Paulo Federal University, Escola Paulista de Medicina. He performed a residence in orthopaedics with Dr. Carols Ottolenghi and was a Fellow in Orthopaedics at the Alfred I. duPont Institute in Wilmington, Delaware, with Dr. J. Richard Bowen. He became a member of the faculty at the Joana de Gusmao Children's Hospital in Florianopolis, Brazil, in 1980 and since 1987 has been the Chairman of the Department of Orthopaedics.